Tomorrow I'm running my first race. 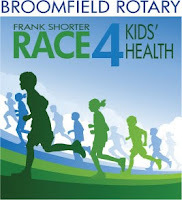 It is the Broomfield Rotary Frank Shorter Race4Kids' Health. After three and a half months of training I'm going to run this fairly short 5K, which will be my qualifier run for Bolder Boulder on Memorial Day. Yeah, I know, who cares? Well, several months ago I was pretty much a couch potato (OK, so I jumped off a plane once and ski and am a roller coaster junkie, but never ran more than 1K). So for me it is a big deal, as much as it was last week when I ran off the treadmill for the first time since I started training. It makes it real. On a different note, April 12 is Yuri's Night. Over the last week and the next, all over the world there are parties to commemorate two important events in human space-flight history. The first human in space, Yuri Gagarin, who on April 12 1961 spent 108 minutes completing one Earth orbit, and STS-1 - the first space shuttle mission, which happened exactly twenty years later. This first flight of the space shuttle Columbia marked the beginning of the current American space era, slated to end this year with STS-134, currently planned as the last space shuttle mission. I'm going to be tonight at the Lazy Dog in Boulder Colorado at our local Yuri's Night party, celebrating these two amazing achievements and also pre-celebrating my first race tomorrow morning.